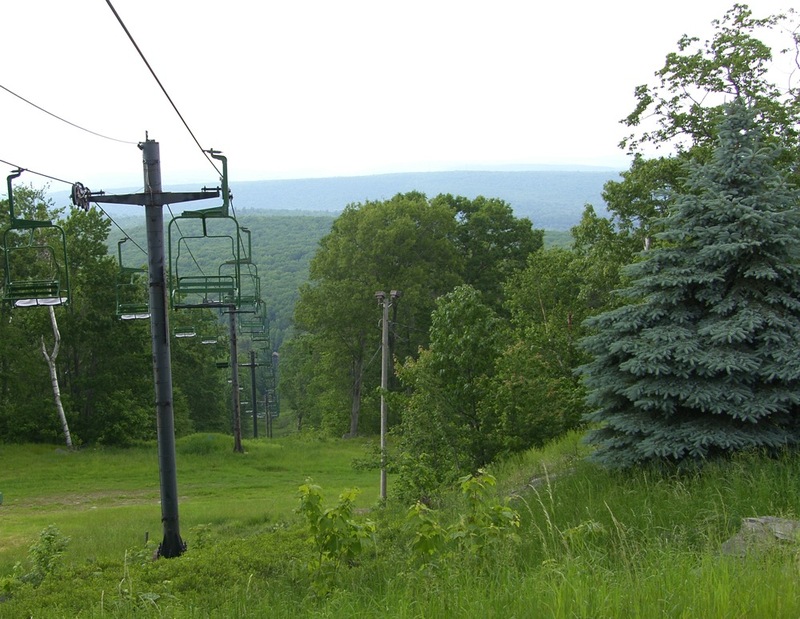 In December of 2010 it was announced that the Tanglwood Ski Area in Tafton, Pennsylvannia was closing. On April 26th of this year the ski resort’s infrastructure was liquidated. Snowmaking equipment, lifts, groomers, the rental shop and everything else was auctioned. Representatives from Plattekill, Thunder Ridge, Kissing Bridge, Mount Peter, Big Bear and Camelback were on hand to look for values in ski area equipment. Laszlo Vajtay, co-owner of Plattekill mountain has built his business by recognizing and capitalizing on these kinds of opportunities. I spoke to Laszlo about the auction and his acquisitions. One large item Plattekill purchased was a 1996 Bombardier MP Plus. According to Laszlo the groomer has 11,000 hours on it — about half a life span — and was meticulously maintained. Plattekill’s existing groomers are also made by Bombardier — one is a winchcat and the other is a frontline groomer. 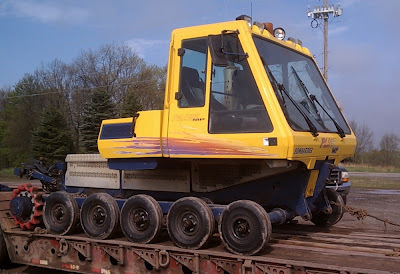 This season when a torque hub went on the frontline groomer, mountain ops was forced to use the winchcat for all grooming, which is costly. Laszlo’s original intent was to use the machine for parts, but the unit is in such good condition that the groomer is going to be on the front line. Another big purchase was a Hall double chair. This lift will replace the current handle tow that serves Plattekill’s beginner slope and tubing hill. The 75 horsepower lift will allow the mountain to extend the length of the teaching slope to accommodate Plattekill’s growing beginner lessons business. In addition, sheave trains from this lift are compatible with the mountain’s other Hall lifts. Plattekill also grabbed two Areco fan guns and 80 hydrant sets. The long term plan is to add snowmaking to Freefall and Plunge: the hydrants will eventually be used for that project. Notable deals snagged by other ski areas included an incredible bargain on a 7500 cfm air compressor taken by Charles Blier of Camelback, a Borvig Chairlift acquired by Kissing Bridge and snowmaking pumps purchased by Little Switzerland ski area from Milwaukee Wisconsin. Recycling a ski area… sad but good, all at the same time. I only live a few minutes from Tanglwood, three of my four children started out skiing there with our local catholic school. Lodge is at the top of the hill one of the few places you could see the kids out the window skiing down the slopes. I was layed off from my normal job in 1989 and worked there as a lift attendant. One friends wife is a bankruptcy lawyer and had mentioned several revival deals falling thru in the last year or so. At least now when I ski Platt I can look over and see the double and remembering riding that lift with my three small children not so long ago. Hugo drives a Le Car. Great news… I’m glad to see Plattekill going full steam into next season with big improvements. Plunge+Overlook+Face+Powder Puff every weekend on a solid base would really mean something for everyone on every visit. The biking looks great this summer, too, and I can’t wait to get up to try it. One question, will there be more vert added to the beginner area? It seems a little small right now to justify a chair… Maybe it should just go up to the true summit and open up the other valley! Congratulations on the acquisition. My beginner friends will love the double on the beginner hill! The Bombardier demonstrates quality French-engineering not seen since the Le Car and power in a groomer seen rarely since the industry lost its appetite for the unrefined Yugoslavian Bika Tojas. @ml242 – It’s my understanding that the teaching slope will be extended from 600 to 1000 feet in length. CF, I'll bet a donut that Plattekill will continue to serve up great steep terrain with natural snow surfaces. Oh yeah, I agree that Freefall should be natural. But I hate it when the trails under the lift are bare and you're skiing on a man made surface elsewhere. Sure, it’s unavoidable sometimes but it also bums me out. Can’t help but think that some man made blowing into the woods by Plunge might be interesting, too. Also, this is sad for Tanglwood. Even though I never heard of the place, I’m sure people enjoyed it in its day. I’m glad that Plattekill did not get the Borvig chairlift. There have been several industry reports suggesting that Carpathian riders complain of "arany air"…aka: valagom viszked. I look forward to many comfortable rides on the lifts, and in the SLM van. Harvey, this sounds like a great score for Plattekill. I heard they also got a great deal on a bunch of snowmaking equipment from Big Tupper in the past few years. Any idea what they actually bought from Big Tupper? Just as long as they dont use that groomer too much… it seemed to me that plattekill was doing more grooming this year than in the past, though it was possible that with the poor base, they were simply trying to preserve whatever they could. I’m with you – that’s all Platty needs, another groomer. It was a better place 5 years ago before Macker went crazy with the grooming. @Anon May 8 12:09pm: Laszlo bought a bunch of Big Tupper tower snowguns in April of 2011. Over the course of several purchases he bought all of their remaining inventory. Not positive but I think those are ratniks.